Senior guard Brianna Cummings dribbles the ball up the floor during a women's basketball game against Richmond Saturday. Saturday afternoon was a day to forget for women’s basketball, but for senior guard Brianna Cummings, it was a day to remember. 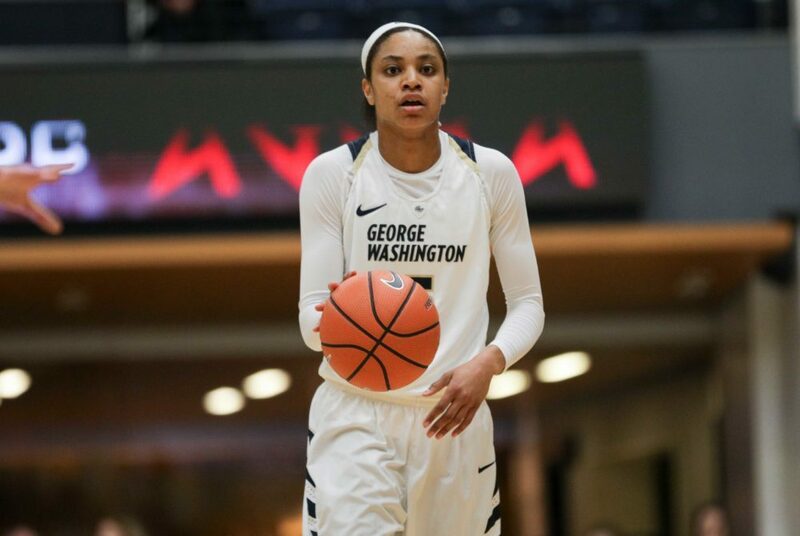 Cummings scored her 1,000th career point with 7:30 to go in the fourth quarter as GW (15-13, 10-6 A-10) fell to Richmond (13-16, 8-8 A-10) 49–36 on Senior Day at the Smith Center. GW struggled offensively, shooting just 31.0 percent from the floor. Senior forward Kelli Prange – the team’s second leading scorer behind Cummings – managed just two points while turning the ball over three times. Richmond’s defense made life difficult for the Colonials all afternoon. The Spiders kept GW to the outside and forced shots from the perimeter as the shot clock wound down. Prior to the game, the Colonials hadn’t scored fewer than 44 points in a outing, and their field goal percentage was the second worst of the season. Despite the loss, GW’s defense, which has been a strength of the team all year, held their own and forced the Spiders to just 39 percent shooting from the floor and only yielded two free throws all game. The Colonials got off to a slow start, trailing 9–0 after just three minutes. Rizzotti tried to change things up by putting Prange and senior guard Camila Tapias on the bench for extended periods of time, but her team still found themselves behind, 16–8, after the first quarter. In the second quarter, GW was much stronger on the defensive side of the ball, limiting the Spiders to just five points. The effort was not capitalized on, as GW barely improved on their first quarter performance offensively and scored just nine points. Junior guard Mei-Lyn Bautista came out of halftime and hit a three pointer within 15 seconds – what would be the Colonials’ only field goal of the quarter. Tapias’ pair of free throws provided the only other points for the Colonials, who trailed 33-23 heading into the fourth quarter. The Colonials will be back in action Tuesday at the Smith Center as the No. 5 seed, hosting No. 12 La Salle.